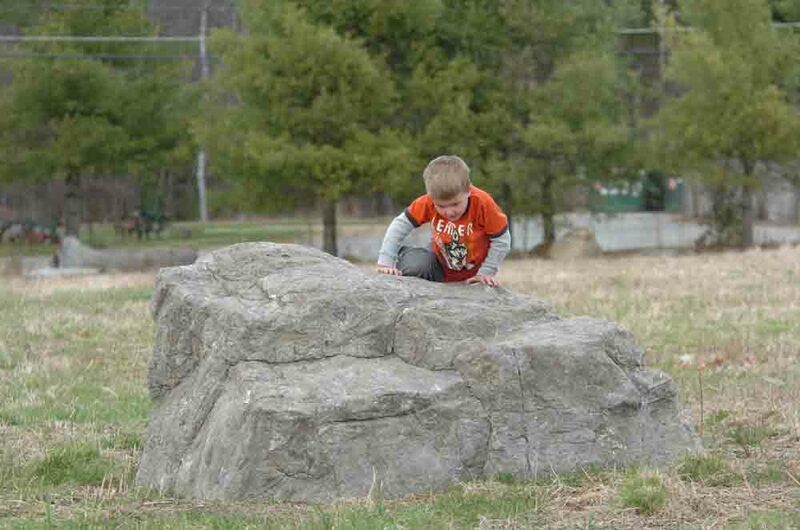 Whether to meet the constraints of budget, space, or to provide just the right size for your kids’ playground, the smallest of our Playground Boulders is fantastic for young children. With safety in mind, especially smooth curves and subtle changes in the rock angle are designed to minimize the chances of injury from a child from grabbing or hitting a sharp edge. Boulder. The Earth Anchors cannot be placed through the hole in the leg bracket. They must be set next to the hole in the leg bracket in a position where the bracket can be lifted over it once the anchor is driven into the earth. a. Note: Boulders contain more anchoring brackets than are required for final installation. This provides flexibility if one location is not able to be utilized. Note: These fantastic rock creations are custom made to order and now can be created and ready to ship in 5 business days to produce (a little longer during the busy periods). Each rock goes through 6 processes before it is shipped. First, we mix our patented compounds to your color choice and line the rock mold to the correct thickness forming your rock. Second, we allow the compound to cure & dry then we remove it from the mold. Third, on some rocks, we then spray a fiberglass reinforsement layer on to the inside of the rock. This then has to cure. Fourth, we trim off any excess compond and fiberglass so your rock will sit flat. Fifth, we apply a waterproffing sealer to the outside of the now cured rock compound so it will last for many, many years. Sixth & last step, we select the proper box/pallet and pack your order so it can be safely shipped to your location. Shipping costs include a pallet, labor and packing materials to protect your order, & LTL shipping to your location. If you want to save on shipping costs, you are welcome to do a factory pick-up. We are located in Winchester , VA. 22603. If you want to do a factory pick up for this order, please let us know in the comment section and we will manually remove the shipping costs from your order before we process your charge card. A new order confirmation will be sent to you.